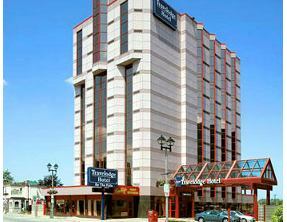 The Travelodge Hotel By The Falls is an 11 story, 120 room, located in the heart of Niagara Falls, just steps from the majestic Falls. On site parking conveniently allows our guests to walk to all of the amazing and exciting attractions located in Niagara Falls, including the Maid of the Mist, each of the Casinos & The Clifton Hill Tourist Area. Guests can enjoy wonderful accommodations in one of the spacious rooms available at the Travelodge by the Falls, including family suites and honeymoon suites. With great room amenities such as non smoking rooms, free internet, pay per view movies, and all the bathroom essentials, this Niagara Falls Travelodge Hotel is the ulitmate getaway destination for any traveler. Along with being located in the heart of the Tourist District, this Niagara Falls Hotel offers guests a variety of amenities to make their stay enjoyable. With great hotel amenities such as the heated indoor pool, whirlpool, sauna, children’s outdoor wading pool and sundeck, guests can experience it all at this fabulous Travelodge Hotel in Niagara Falls, Ontario. Your choice of rooms with queen beds or large family rooms that have two queen beds and sofa bed, fridge and microwave. For the romantics, rooms with king beds and heart-shaped whirlpool tubs are available. All rooms are smoke free and wireless internet is available in all rooms as well. Canada’s largest restaurant chain since 1960 is available at the Travelodge by Falls. This Niagara Falls restaurant is located in the lobby of the Travelodge Hotel in Ontario, Canada. Smitty’s offers all day breakfast, all day lunch and all day dinner. Enjoy the classic Smitty’s dining in the heart of the tourist area at the Travelodge by the Falls Hotel.